We at Valoriani UK pride ourselves as a pioneer of the introduction of wood fired ovens to the UK in 2002 and have many thousands of Forni Valoriani oven installations across the UK with more high profile commercial installations including Harrods, Museum of London, The River Cafe London with many residential and mobile oven installations too. Coveted Valoriani refractory clay static and mobile wood and gas fired ovens continue to lead the way globally in clay oven design and manufacture. The superior heat retention properties of Valoriani ovens lies in the unique ‘Cotto Clay’ from which the ovens are made, clay that can only be found in the Valoriani family quarry in Reggello, Florence that has better thermal efficiency than typical clay and have been tested 100% food safe and carbon neutral when used in accordance with the manufacturers instructions. Forni Valoriani pride itself with the longevity of service of its’ ovens globally with a proven track record of ovens still in continuous daily use for over 30 years. Unlike “micro-mesh” technology or cement based products, Cotto Clay does not have metal or fibre particles added and has exactly the right consistency of alumina for the firing of refractory brick, allowing for the absorption of steam that is released from cooking. Too much alumina increases the strength of the material, but decreases the porosity of the clay thereby reducing the absorption of the steam. The natural porous feel that Valoriani ovens have is essential to the cooking process. This ensures that you can cook in your oven by day, leave it overnight and still have it warm enough to cook breakfast the next morning. The interior oven walls and overhead crown elements are all un interrupted curves, allowing more natural movement of the air inside making cooking more consistent. The oven mouth opening of wood fired ovens is crucial to maximising fuel efficiency. Valoriani ovens are designed to achieve the optimum balance between good visibility into the oven whilst achieving high fuel efficiency. 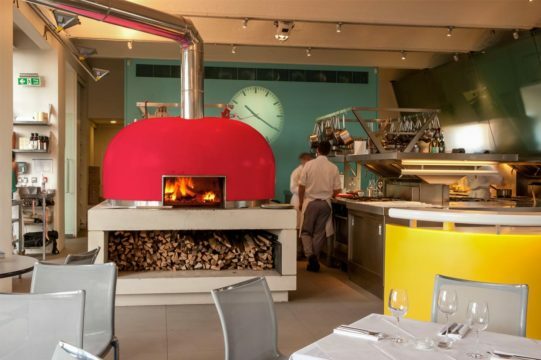 From the Valoriani stable of ovens the Verace is the first gas fired pizza oven globally accredited by Associazione Verace Pizza Napoletana [AVPN] to enable the creation of an authentic Neapolitan pizza. Valoriani hold the patent for their recycling system that allows for the recycling of heat emissions for consistent heat distribution across the entire cooking floor allowing for greater cooking accuracy and fuel consumption. All Valoriani ovens supplied by Valoriani UK are DEFRA Licensed allowing them to be operated legally indoors and outdoors, including smoke control zones and when used in accordance with the manufactures instructions, carbon neutral. With environmental inspections on the increase DEFRA Licenses are a must for commercial, domestic and street food vending use. In addition to our static Professional and Residential oven ranges we offer mobile derivatives under Valoriani TO GO that include The Fornino al Fresco, Forno Ape, Forno Bici, Forno Trailer and bespoke mobile solutions too, all suitable for street food vending. We pride ourselves on offering pre sales advise and recommendations for oven specification, size, capacity and ventilation and offer a full turnkey installation service without the need for heavy lifting equipment, removing walls, windows or doors. We have a dedicated pizza and general cooking demonstration kitchen and showroom in the UK at our Head Office in Preston, 2 Hours 20 Minutes from Glasgow Central and 2 Hours from London Euston, so if you need any guidance, inspiration or the chance to try before you buy, we will be more than happy to assist you. We also have many recipes on file and years of experience to share with you, as the leading expert in our field.